The Clumber Spaniel is generally laidback and inconspicuous compared to many of the other sporting breeds. It is not a vocal animal when it is in the home as a house pet and getting the Clumber Spaniel to participate in exercise may take some motivation from the owner. It is considered one of the only sporting breeds that can adjust to life as a house pet and once it does adjust, the Clumber Spaniel quickly becomes very loyal to its owner. However, it is a natural hunter and can still be a grand partner while out in the field. As the Clumber Spaniel is a sporting breed, it prefers exercise in the form of an outside excursion or adventure. It can also maintain its physical fitness needs by going on a walk or a hike with its owner. With its white coat, the Clumber Spaniel needs significant coat maintenance with brushing occurring at least two to three times in a week. Some may need bathed on a regular basis as well since the white coat may very easily collect dirt from being outside. Some Clumber Spaniels may snore during sleep, while a majority of them have a tendency to drool. 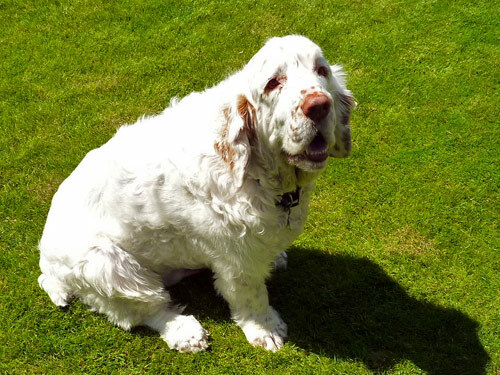 The major health concern for the Clumber Spaniel is the development of Interverebral Disc Disease, commonly referred to as IVDD. This is a condition that arises when disc material that is herniated beneath the spinal cord puts pressure on the cord. Minor health concerns for the Clumber Spaniel include ectropion and entropion, which involve the eyelids and the cornea, and externa, which involves a disease of the ears. Clumber Spaniels occasionally have problems with seizures. In order to keep it healthy, regular tests of the hips, eyes, and elbows are recommended. A healthy Clumber Spaniel will have a life span of about ten to twelve years. The English Toy Spaniel enjoys being playful and carefree. This lap dog has many desirable qualities, including being peaceful, cordial, tender, and silent. In addition to its good-natured manner, it can also engage in an energetic play session and be very considerate. The English Toy Spaniel is loyal to its owners and for this reason it can be timid around people it does not know. The breed has a tendThe existence of the Clumber Spaniel dates back to the late 1700s. It is one of the most thickset versions of the spaniel family. It is commonly believed that the breed was derived from a combination of the old heavy-headed Alpine Spaniel and the low-bodied Basset Hound. During the French Revolution, there is a theory that the Duc de Noailles of France moved his spaniel’s kennels to the Duke of Newcastle’s English nobility. The Duke of Newcastle became accustomed to the hunting and retrieving skills of this breed of spaniel and it is believed that this is where the Clumber Spaniel acquired its name. Clumber Spaniels became the choice breed of higher society and because of this it became one of the initial breeds that were show dogs. The commoners of society did not have Clumber Spaniels because of the association of the Clumber with wealth and high society. Today it still remains one of the only sporting breeds to be shown and attain high show honors. Despite Clumber Spaniels making their arrival to the United States towards the end of the 1800s, the public still remains quite unfamiliar with the breed. It has remained a popular choice for the field due to its many natural attributes.ncy to be stubborn.